“A romance may end triumphantly or tragically, but it won’t be boring. Not in this place. This is where Hemingway fished. Where Scot wrestled Zelda. Where Stein kissed Toklas. Where Baudelaire glowered at a dress. And we are all part of it. Part of the same story. I have never been to Paris. I would probably be embarrassingly a tourist if I were to go. Someday I will. But for now, I enjoyed this short read. 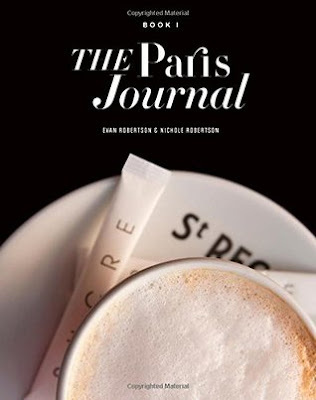 The Paris Journal is 17 short journal entries broken up by over 140 gorgeous photos. These journals cover one day of an American visiting Paris. Our diarist is alone, jet-lagged, and lets her mind and imagination wander over the people she sees (imagining their stories) and the moments she experiences. It’s got the perfect balance of subtle humor and beautifully quotable lines. While this book is easily a coffee table piece for its photos, I found it a perfect little release for my afternoon. It took me 45 minutes to read through and I enjoyed the imagery of the words, not only the photos. I do like clever writing, and instead of going on and on with details and explanations, this was a very distilled experience. It made the words easy to read, and gave the photos depth. I recommend having some good bread and cheese on hand before reading this, because you’ll be dying for it by the end. I liked that this focused on some of the iconic parts of Paris, but left out all of the cliches. You won’t find a single photo of the Eiffel tower here. ha.